Our findings are consistent with APRA’s figures which found industry funds made up 6 of the top 10 funds since 2006. Despite their enormous size, all of the big banks did worse than at least 99 super funds over the past 10 years! There’s no doubt that industry funds do better than bank funds, but when comparing like-for-like investments the lead is less obvious. It’s why we decided to question why industry funds aren’t doing even better. The reason is simple, on average industry funds have lower fees and more growth assets. Their advantage over retail funds can be entirely explained by a combination of lower costs and higher risk. Removing these factors, industry and retail funds perform in much the same way because they generally use the same fund managers and own the same underlying investments. What’s the problem with industry funds? Despite doing better than retail funds on average, what’s noticeable is the huge difference in the performance between industry funds over time. Here are the top 5 and bottom 5 performing industry funds over the 10 years to June 2016 according to data from the regulator, APRA. Clearly you need to be selective even if you’re in an industry fund as the differences in returns can be huge, 50% or more over 10 years. The relationship between size and performance is weak. Funds with less than $1 billion struggle because their costs are too high but scale benefits tend to disappear between $5-$10 billion. Only one of the largest industry super funds made the top 5 list (UniSuper). REST, AustralianSuper, HESTA and Sunsuper were all absent despite being the largest industry funds and controlling a combined $220 billion of assets. 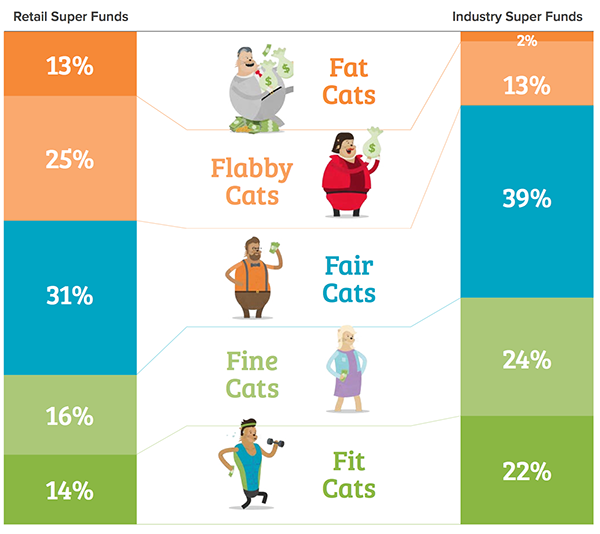 Our Fat Cat Funds Report shows many smaller industry super funds performed as well or better compared to larger funds. BUSS Super Queensland at $4 billion of size performed about 0.5% per year better than AustralianSuper ($100 billion) over 5 and 10 years. Industry funds’ explanation for spending millions of member dollars on advertising and sponsorships each year is size will drive economies of scale and better member outcomes. The data doesn’t back this up. Even at $100 billion of member funds AustralianSuper has been increasing their administration fees. According to their annual report admin and operating expenses rose from $103 million in 2006 when it had 1.3 million members, to $262 million in 2016 with 2.1 million members. That’s a jump from $79 per member to $124 per member in a decade. The performance differences between industry funds highlights a concerning fact – despite their ‘to-benefit-members’ mantra, industry super still allocate the majority of their funds to relatively expensive active fund managers whose performance as a whole do not justify their costs. This continues despite the evidence that active stock picking and market timing deliver worse outcomes for investors. Over the 10 years to 30 June 2017, 75% of Australian large cap active share managers, 90% of international active equity managers and 86% of bond managers underperformed. Active management explains why there is such large variance in the performance of industry funds. Many rely on active managers being lucky rather than focusing on the factors within their control – cost and risk. Here are 4 important questions to ask your industry fund. Do they advertise, and if so why? AustralianSuper spent $11 million on advertising over the last 2 years and yet their investment performance barely gets them into the top 10 industry funds. Meanwhile their admin costs have been rising not falling. The idea that TV ads and sports sponsorship leads to more members, lower costs and better benefits just doesn’t stack up. I joined AustralianSuper 5 years ago expecting that scale would reduce their costs… over that time my annual admin fee has increased. I’d like to know how increasing my administration fees and sponsoring ‘The Voice’ has helped my retirement? How much do they invest in unlisted assets? Over the past 20 years many industry funds have been increasing their investment into unlisted assets. These types of investments can do well and add diversification to a portfolio but they have added risks since they can’t be sold easily and their market value is hard to determine when fund members want to get in or out. This was apparent in 2008-9 when some industry funds refused redemptions and others like MTAA super lost $1.6 billion due to poor hedging of unlisted assets. The characteristics that make unlisted investments attractive can also make them dangerous if they become too much of a portfolio or if their risks aren’t managed well. Do they use index investing? Scale is all about driving down cost for the end investor, so it’s bizarre that most industry funds don’t invest with the world’s largest investment manager – Vanguard. Vanguard has a 40 year history of reducing fees for clients as a mutual organisation owned by its investors. Most industry funds don’t invest with Vanguard and still use active managers, despite all data showing that strategy doesn’t work. 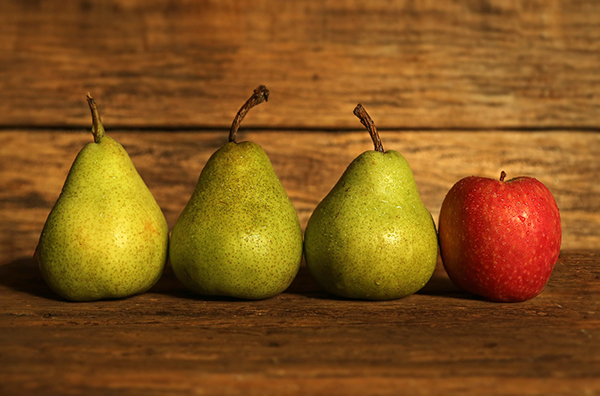 A recent study out of the UK showed that 96% of multi-asset strategies do worse than a simple bond/equity portfolio dubbed ‘the no brainer portfolio’. This is not good news for industry funds who are paying asset consultants and internal teams big money to devise more complicated but ultimately less effective strategies. Will they show how their active fund managers are performing? Looking at dozens of industry funds we couldn’t find a single one that had provided transparency around how active management was benefiting their members. Similarly the Productivity Commission reported that only 5 of 208 super funds were willing to share data on asset level returns. Fees eat into returns and active managers charge higher fees than indexing so if they are being used, members deserve to know how much they are being paid and whether their performance is providing value for money. Did your Industry fund’s active bets on Australian shares beat a simple index fund after costs over the last 10 years? Will they provide the data to show it? Industry funds position themselves as the low-cost alternative to retail super funds. Compared to retail funds, industry funds win hands down, but by global standards they are eye wateringly expensive. The Grattan Institute estimates that a public tender process for default super would reduce super fees by two thirds to 0.3% from 1% today. Less advertising, fewer asset consultants and more indexing would put billions back in the pockets of everyday Australians. Active vs Index investing – what’s the difference?